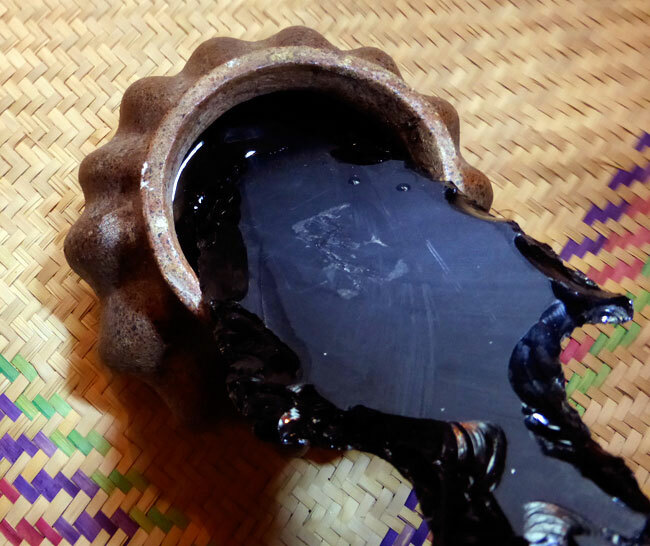 What exactly was ‘obsidian medicine’ for the Aztecs? According to the Codex, ‘in order that they [the victims] would not fear, that they would not dread death, they first made them drink what they called the obsidian medicine. It is said that apparently by means of it they deprived them of their senses, of their consciousness, so that no longer would they be afraid at the time that they cut open their breasts.... some... became quite deranged; quite of their own wills they climbed - ran - up to the top [of the temple] of the devil, longing for - seeking [death], even though they were to suffer, to perish.’ Powerful stuff! But was it ‘medicine’, and did it contain obsidian? 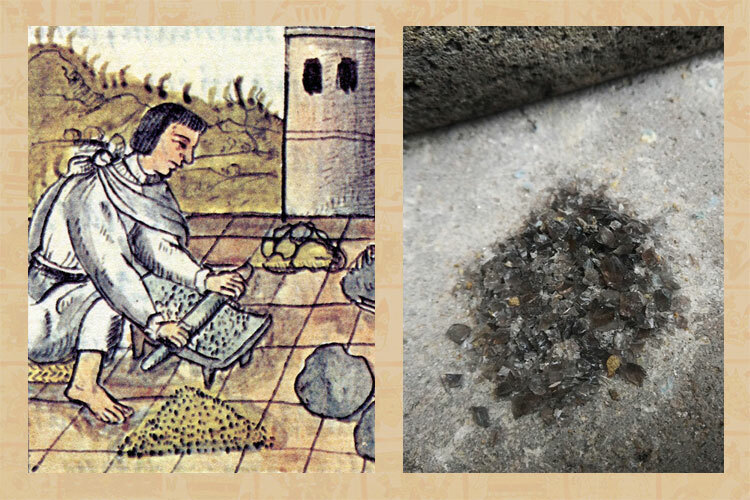 We should remember that the Nahua had a high reputation and respect for medicine, which they defined - significantly - as ‘knowledge of precious stones’ and to which they attributed a noble Toltec origin (Book 10) (pic 2). Earlier in the same book, a good physician is depicted as ‘a knower of herbs, of stones, of trees, of roots’. To give one example, the ‘bloodstone’ (eztetl) (pic 2, bottom) (so named as it appeared with a mottled-blood texture) was recommended for soothing a wounded, bleeding body. ’The Mexican physicians understood the use of treatment founded upon a certain knowledge of the human body - a knowledge that was no doubt quite widely spread in a country with such frequent human sacrifices - and of the properties of plants and minerals. They reduced fractures and they splinted broken limbs. They were clever at bleeding patients with obsidian lancets. They put softening plasters upon abscesses and finely-ground obsidian upon wounds - “Ground like flour, this stone spread on recent wounds and sores, heals them very quickly” [Sahagún]”’. But was it actually consumed as a drink...?! Another source comes close to the idea: in his classic work Diccionario de Mitología Nahuatl, Cecilio Robelo quotes Torquemada describing a highly esteemed and ‘mystical’ drink consumed by the king and his entourage that was said to infuse and invigorate the soul with valour and ‘unstoppable determination’, taken when swearing an oath at moments of great historical importance. This was itzpacalatl (also known as itzpactli), ‘water of washed obsidian’, a mixture of human blood (from sacrifices) and the residue from ritually washing obsidian blades used to sever human flesh. Since obsidian was believed, like gold and silver, to be a divine secretion, such as seed - of celestial origin but residing below the earth’s surface - miners of obsidian may well have feared disturbing the earth’s innards, as they dug deep down into the ‘prohibited underworld’ (Pastrana). 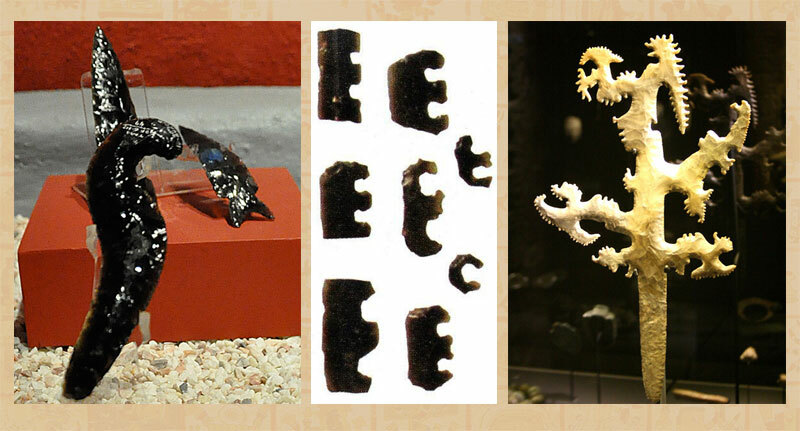 Not surprisingly, (protective) figurines of gods associated with obsidian (Tezcatlipoca, Itzpapalotl, Itzli...) have been found both in mines themselves and in obsidian workshops above ground. Miners had to perform important rituals dedicated to these deities both before and after physically entering the underworld. It’s no coincidence that one of the challenges facing souls on their four-year journey down to Mictlan was facing an icy wind that could slice through you ‘like an obsidian blade’. So where does all this leave us regarding ‘obsidian medicine’? The answer lies in OTHER deities bearing associations with obsidian. 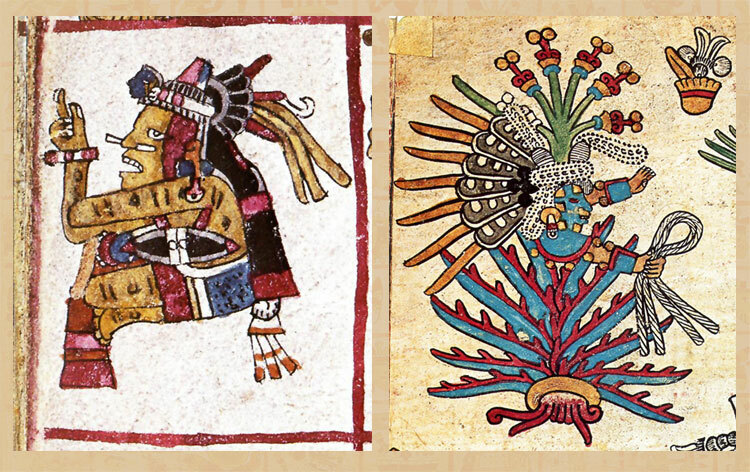 In his masterful book on Tezcatlipoca Mockeries and Metamorphoses of an Aztec God, Guilhem Olivier notes ‘The deities of the agave wine and the drink itself are sometimes associated with obsidian or flint’, with flint knives appearing symbolically over bowls of octli (known as pulque in Mexico today) (pic 7). The eminent German scholar Eduard Seler was one of the first to describe the ritual alcoholic drink of the Aztecs as ‘the “cutting” drink’. Pulque deities, such as Patécatl (sometimes found as Pantécatl) can be seen carrying obsidian instruments (pic 8, left). And an obsidian sceptre with a spherical crown was an important accessory of Techálotl, another pulque god (follow link below to learn more). But we’re not talking here of ‘standard’ pulque: there was a super, knock-out ‘augmented’ variety which contained a special root or herb - sometimes called a ‘pulque enhancer’ - giving it an almost lethal kick. Interestingly, it was Patécatl who was said to have discovered these magical roots that were added to aguamiel (‘honey-water’ - the sweet sap of the maguey agave before it is fermented). The root, called quapatli or ocpatli was always shown as a folded, knotted two-strand cord (pic 8, right). Perhaps the effect of adding this root was, like other drugs commonly found in ancient Mexico, hallucinogenic. Fray Durán mentions such powerful ‘wines’ more than once, usually ‘in connection with men about to endure a terrible fate...’ (Berdan & Rieff Anawalt, vol. 2). 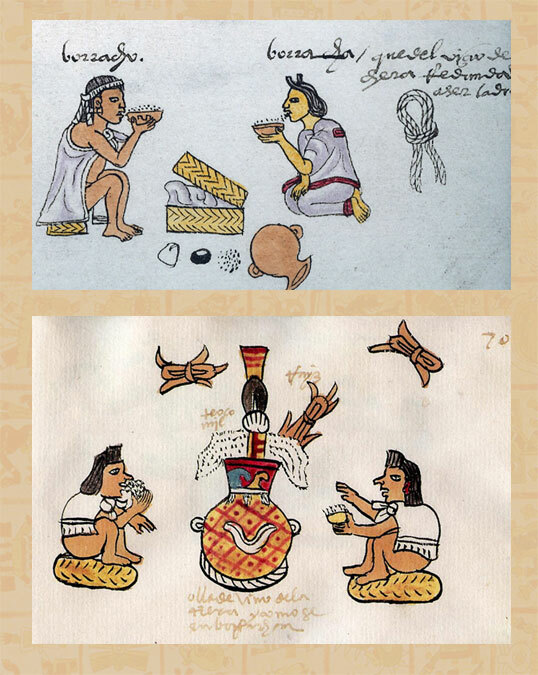 Whilst supposedly restricted to ritual and ceremonial use, examples in the codices clearly show the pulque enhancer root linked to scenes of (commoner) drunkenness; in the case of the Codex Tudela (pic 9, bottom) the root is actually entering the vat of pulque! • A Guide to Tequila, Mezcal and Pulque by Virginia Bottorff de Barrios, Editorial Minutiae Mexicana, Mexico City, 1980. 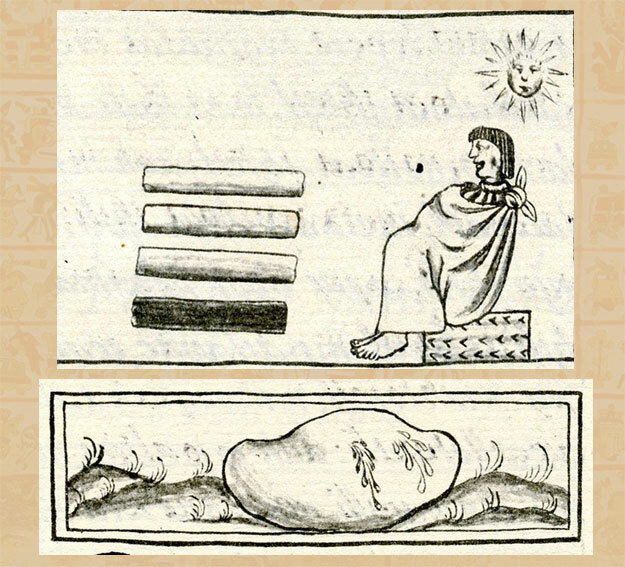 • Pic 9 (bottom): image from the Codex Tudela scanned from our copy of the Testimonio Compañía Editorial facsimile edition, Madrid, 2002. Q. 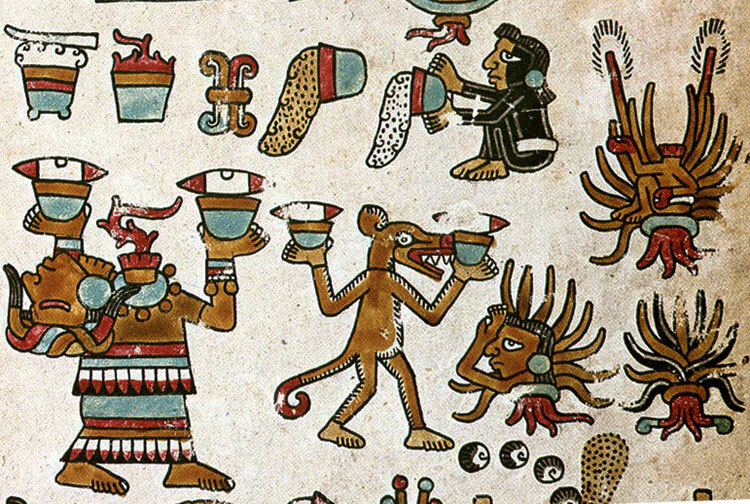 How would you describe an Aztec sacrificial victim who’s been given ‘obsidian medicine’? Speaking of pulque with enhancers, when I worked in Tlaxcala we were at an ex-hacienda pulquera, and they still make great pulque there. The ranch hands called pulque with a shot of tequila in it “pulque con espuelas” (with spurs). You can imagine what happened when archaeologists had too many of those!